I’m not one to rush the seasons, so thinking about Christmas cards when there are only a few summery days left to savor isn’t really my inclination. However, after seeing Festive Friday’s last few challenges and the inspiring work by the design team, I felt inclined to play along. I loved the non-traditional palette of the inspiration photo. 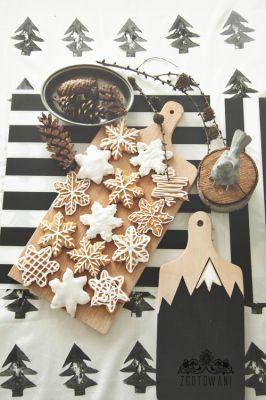 There are so many fabulous elements to chose from–the wood stump, pinecones, grey bird, frosted cookies. I’ve made two cards, but the image has me thinking of many other designs that perhaps I will have a chance to execute before the deadline. A few of us gathered for a festive day of crafting on the beach this weekend, so I was able to complete the second of my two holiday cards. I will start with that one! Given the state of affairs in the nation and world at the moment, this seems an appropriate sentiment. But then again, when in history hasn’t it? This card features the black and white elements, the stripes, branch, and kraft. After finally inking up my Hero Arts letters, which I have been dying to use for months, and stamping on Ellen Hutson White Linen paper, I put together my earth and wreath. 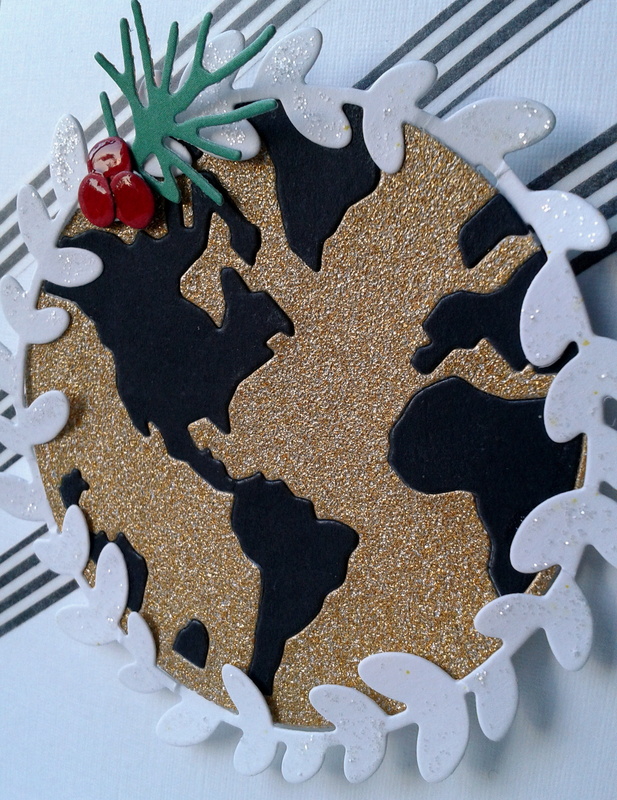 The earth from MFT’s Centerpiece die “You Mean the World to Me” was cut twice from black and gold glitter paper, and the black continents inlaid. All were adhered to a die-cut circle. I felt that my card needed a pop of color, so I added a sprig of pine from a deconstructed Savvy die branch, and some red berries, glazed with glossy accents. They look like cinnamon candies! I added some icicle Stickles to the PTI rustic wreath. I cut some Lifestyle Crafts Shape and Tape into strips and adhered after placing my centerpiece. To echo the sprig and berries, I finished off the inside and back with some striped washi from My Mind’s Eye. 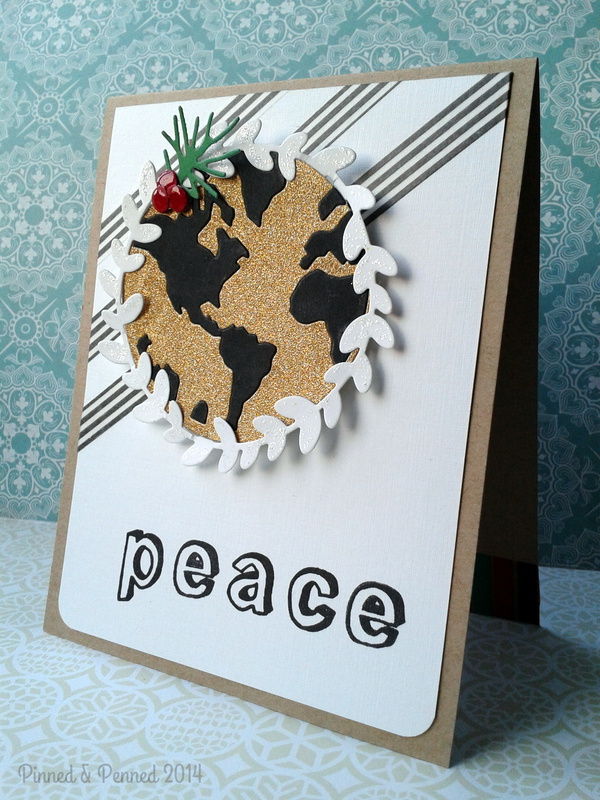 My first card was not only inspired by the inspiration photo, but also the gorgeous creation by Rebecca Luminarias. I always love Rebecca’s style. I pulled some of the gold elements from her card into both of mine. I absolutely love the combination of turquoise and gold, so when my card was finished, I realized it needed a pop of color. 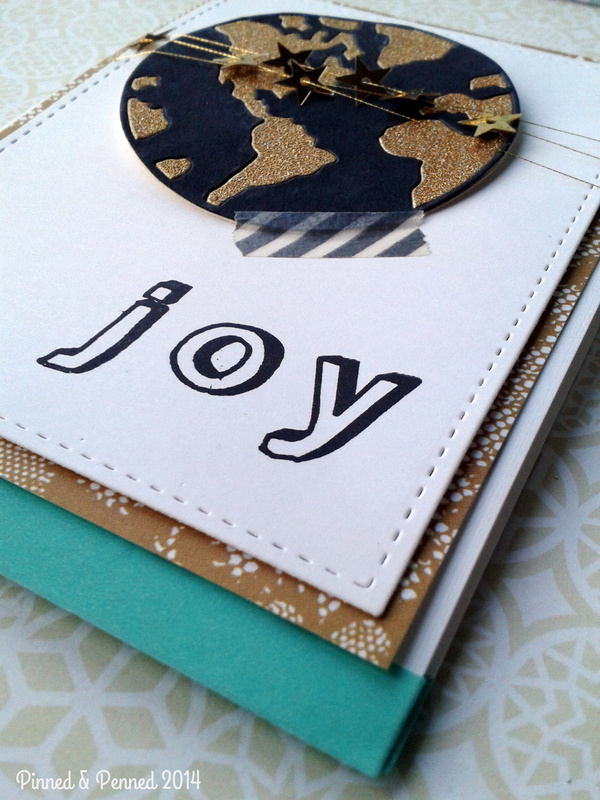 The turquoise washi felt perfect for the bottom stripe on the outside and inside of the card. 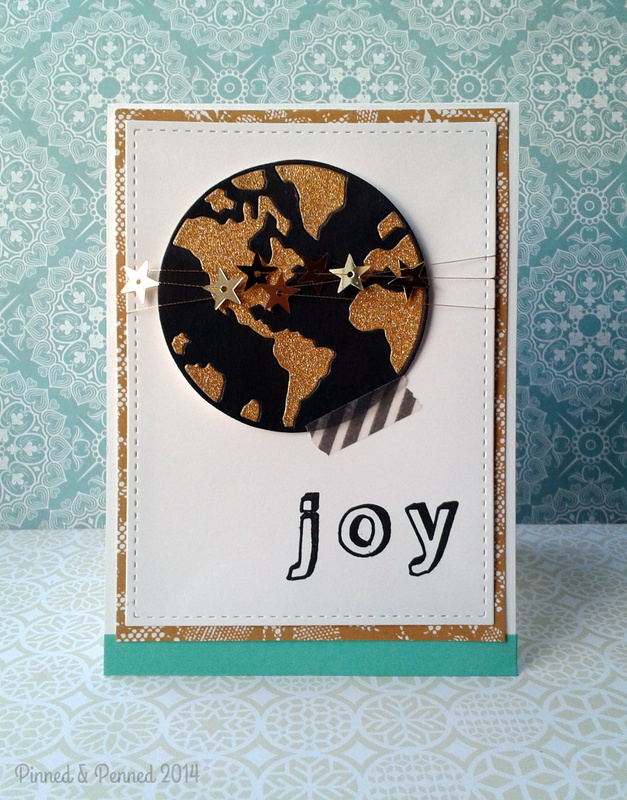 I love the gold lace paper from My Mind’s Eye Market Street pack. Because I only have two pieces of this paper, I didn’t want to waste a bit of it. So I cut out the middle of it before layering– a good way to preserve paper when creating lots of layers! 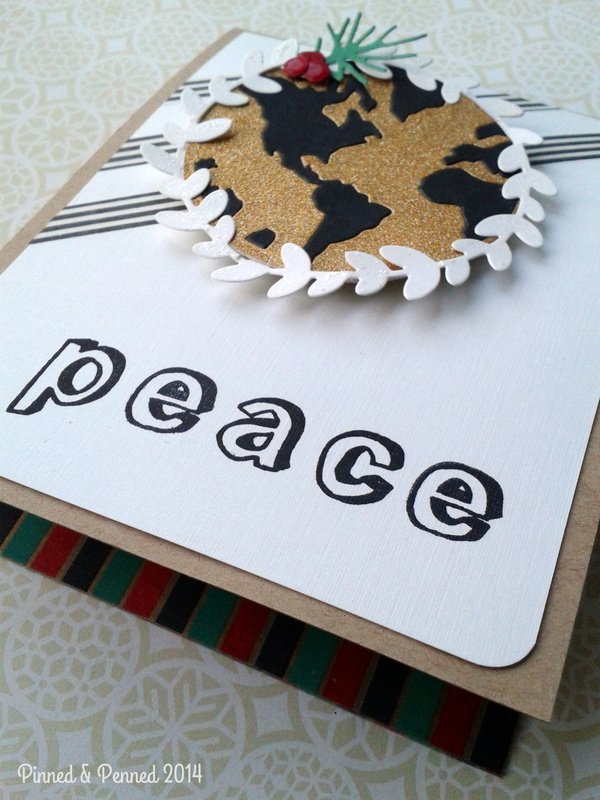 The white layer was die cut using Mama Elephant’s Temme Frames stitched rectangle die. 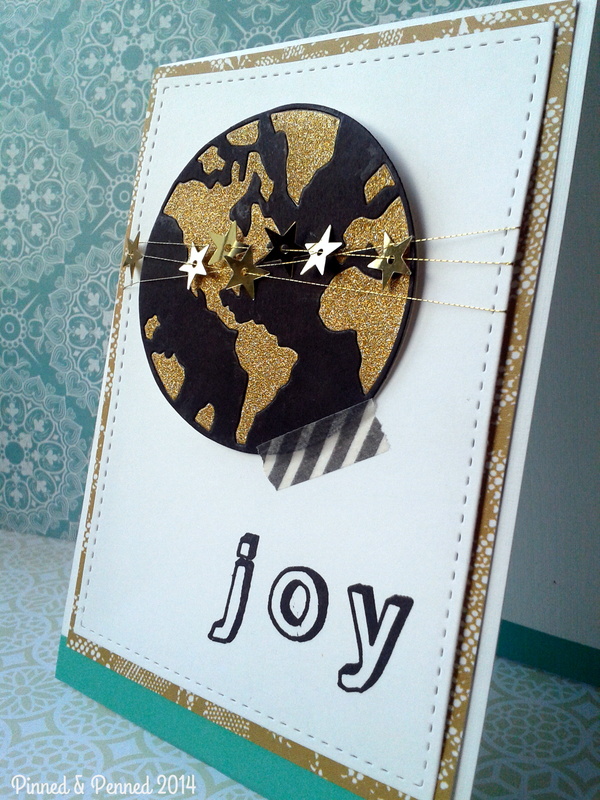 I strung 7 stars along some gold thread for each of the continents and added some striped washi from Stampin’ Up! for some visual interest. 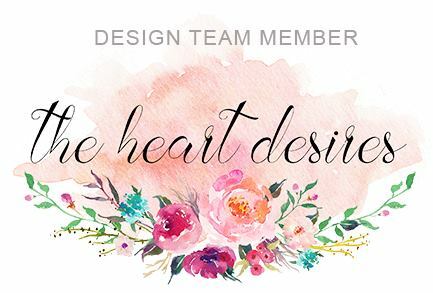 Since Paulina over at Pretty Pink Posh is hosting a die-cut blog hop challenge, I am going to link these up over there as well. So many wonderful creations at both sites– so make sure to stop by and play along! Wonderful designs and colors! 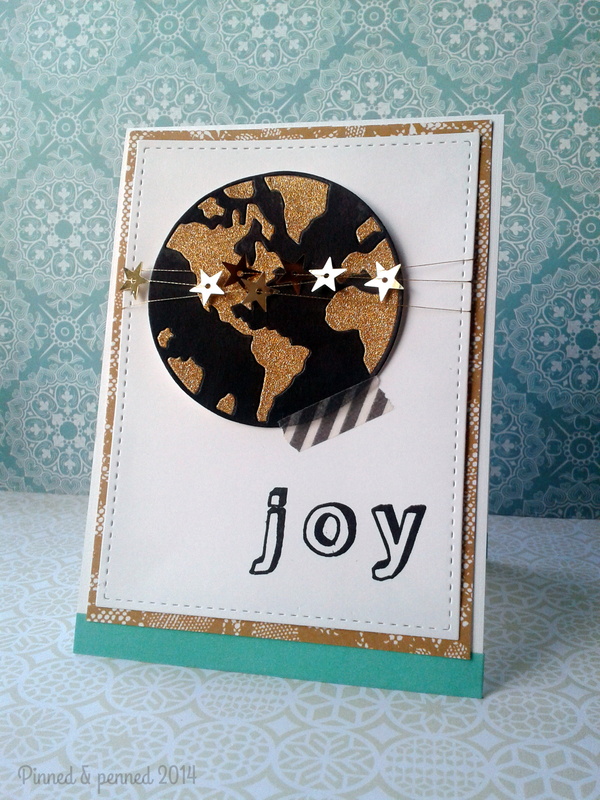 I really love the Joy card – especially the stars on the cording! Just fabulous! TFS! 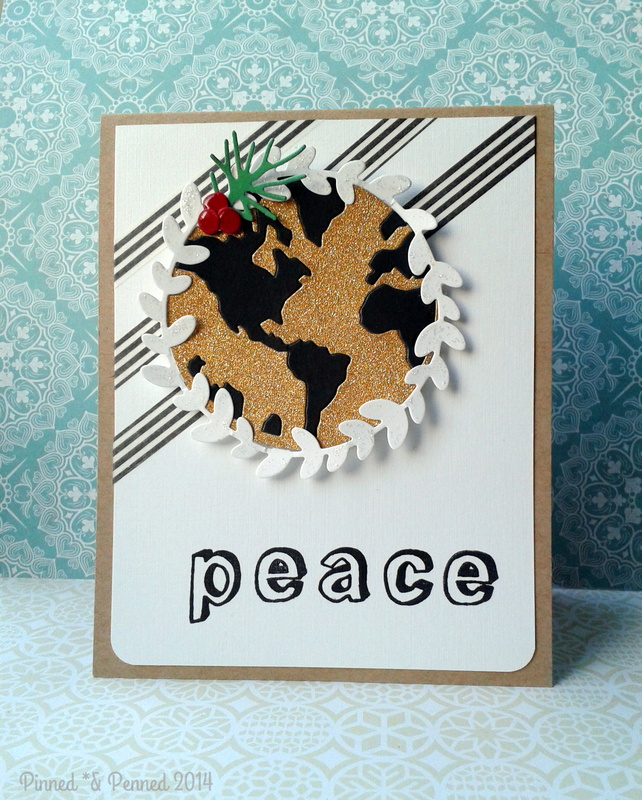 Terrific card and peace theme. Perfect card and beautiful. 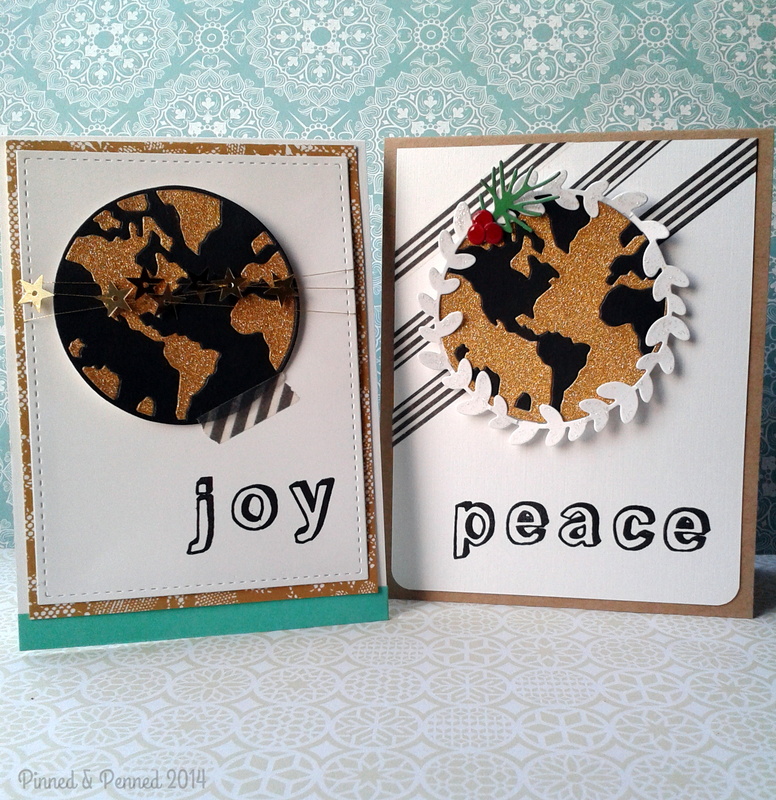 These are fantastic – I love that you made two to take advantage of the positive and negative die cuts! So glad you joined us at Festive Friday! Your cards are very striking and unique! I love the colors you used. Wow!! Both of your cards are amazing!! I love the one with the wreath around it, but I adore the string of stars too! These are both absolutely gorgeous…love all the details Kate! WOW! These are amazing!!! I love them both so much, be still my cas heart! Both of these cards are gorgeous! You have such a good eye for details. The colors are fantastic and that the cards could work outside of the holidays, too. Amazing, and MORE amazing in the the “REAL” loved seeing them close up, so inspiring!!!!!! These are two great cards! I l love your nontraditional focal point image with our nontraditional colors;) So happy you were inspired to join us…they both turned out beautiful!!! Woah, what a post! 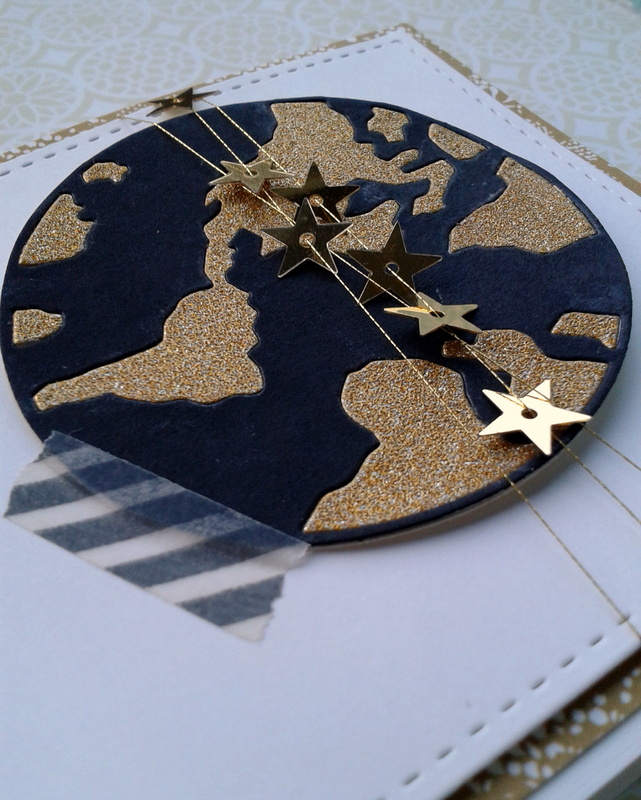 The washi holding up the world on your second card is so sweet and whimsical (as is the wrapped layers of stars!) 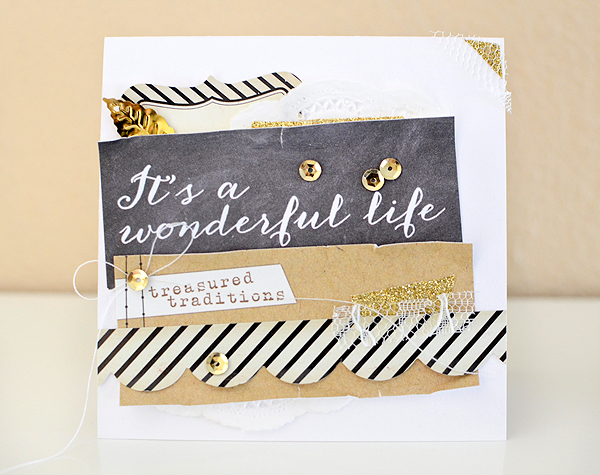 Love your choice to use the gold glitter! I love it for the continents, I think. Wonderful! Thanks for the shoutout, too! I loved the photo inspiration and could make projects for days based on it! I don’t have a FF card this week but I will have one for the midweek challenge.